West Ocean String Quartet introduce a mix of Classical style and Irish Traditional Music through compositions that reflect the structured classical structure and the flowing traditional interludes. A true reflection of the depth of musical experience within the quartet. A hint of Celtic Music that lifts the classical instrumentation to a new level of entertainment. Playing Viola Violin Cello and Fiddle with an occasional Uilleann Pipe session the mix in classical and traditional music is complete. The West Ocean String Quartet formed in 1999 with the intention of exploring and celebrating music both traditional and newly-composed. The four members have very considerable experience across many genres of music and they display a happy disregard for where the boundaries of classical and traditional music meet. Their repertoire is both eclectic and unique. 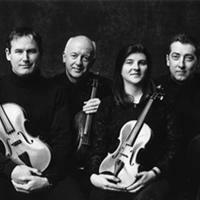 The quartet’s debut CD, Unwrapping Dreams, was released on Wren Records in the summer of 2004, and won the award for Best Newcomers Album in the American Liveireland awards. A BBC television documentary on the quartet screened in 2003. The quartet has performed to critical acclaim throughout Ireland, including sell-out performances in Dublin’s National Concert Hall and Belfast’s Waterfront Hall, and has collaborated on stage and in the studio with, among others, singers Brian Kennedy, Mary Black and Sinead O’Connor, Chieftains’ flute-player Matt Molloy, piper Liam O’Flynn, poet Cathal O Searcaigh, guitarists Colin Reid and Tony McManus and the group Dervish. "Superb quartet who weld and meld classical and traditional music in entirely unexpected shapes". Seamus McGuire, violin, a native of Sligo now living in Donegal. Toured with the much-lauded Buttons and Bows and recorded a solo album, The Wishing Tree. Winner of the coveted Fiddler of Dooney award, he has toured extensively throughout Europe and the USA. Niamh Crowley, violin, from Sligo, won several gold medals as a student at college in London and has gone on to form her own Academy of Music in Sligo. She performs regularly with Barry Douglas and Camerata Ireland throughout the world. Ken Rice, viola, from Kerry, brings a very wide palette of musical colours to the table, from traditional music through jazz, rock and classical. He has performed throughout the world with various ensembles and is a member of the Irish Chamber Orchestra. Neil Martin, cello, Belfast-born, has collaborated with many leading musicians as producer, arranger and performer, including The Dubliners, Liam O’Flynn, Micheal O Suilleabhain, Bryn Terfel, The London Symphony Orchestra, Altan, Donal Lunny and Matt Molloy. Has toured throughout Europe and America and has composed extensively for concert stage, tv, film and theatre.